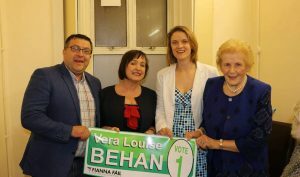 VERALOUISE Behan, a Fianna Fáil candidate for the Athy Local Electoral Area (LEA) in the upcoming local elections in May, launched her campaign on Thursday 4 April with an event at TD Fiona O’Loughlin’s office in Athy. She was joined on the night by Fianna Fáil TD Fiona O’Loughlin and outgoing councillor Martin Miley, alongside friends, family and supporters. Ms Behan, who lives in Maganey with her long-term partner Declan Hayden and their three children, has said her priorities include working to reinforce positive social behaviour, particularly among young people, the development of a dedicated running track in Athy, and the visual improvement of urban areas and ergonomic improvement of footpaths and infrastructure. She aims to work to support the development of town centre properties with a view to attracting tourism and business (as well as the provision of residential accommodation), to see a playground in Castledermot come to fruition, to address rural isolation, and work closely with community groups and ensure resources are made available to them. Another issue which the candidate described as something she is very passionate about is Scoil Mhícíl Naofa in Athy and the traffic situation. She noted that it’s a “big concern of mine” and something that needs to be rectified, referencing the lack of adequate parking facilities in the area, articulated trucks using the road, and immediate infrastructure in the area which she described as outdated and insufficient. Ms Behan added that she is looking forward to the campaigning ahead and she noted her thanks to Anna May McHugh – who was there on the night – for her encouragement, as well as Fiona O’Loughlin and Martin Miley for their support and for sharing their experience. She also thanked the Behan and Hayden families and all of her friends and supporters who attended the launch.